Tryin’ something new. Recap of the second half delayed; tech problems meant this posted a lot later than I wanted it. Sorry. Most teams don’t use this because it’s a kind of slow-developing play to the outside, but Herb Hand once mentioned that it averaged more than 10 yards an attempt at Tulsa for a full season. The play is classic Wing-T: The line, tight ends, and receivers all block “down,” or step to their inside to get an angle to cut off defenders’ pursuit, while both guards pull and lead to the outside. 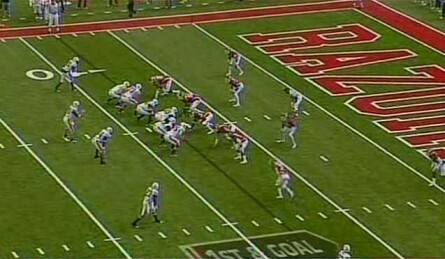 Meanwhile, the quarterback executes a fake, causing the defense to hesitate for just a moment, and off the runner goes. 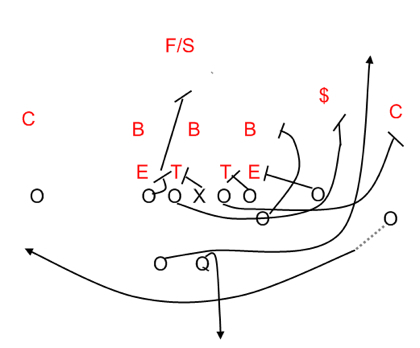 And if the generic buck sweep is classic Wing-T, the Auburn version is classic Malzahn, an age-old concept combined not just with the shotgun but with a funky formation and receiver motion. He can use a variety of sets and looks, but against Mississippi State running back Ben Tate scored on a long touchdown run on this play where Malzahn brought the receiver in a sweep motion and the quarterback, after handing it to Tate, faked giving the ball on the reverse, then faked again as if he was setting up for a play-action pass, all of which is possible in this system. In this post we’re taking a frame-by-frame look at the last of those three runs, which was the least successful–it should have been an easy touchdown, in fact–but illustrates clearly both why the play works and why the edge blocking from Auburn’s receivers and tight ends is so critical. And here’s the buck sweep–Berry and Isom pull, everybody else blocks down. And sure enough, Arkansas is in trouble. They’re blitzing both the linebacker standing up at left end and the corner, leaving a second linebacker in man-to-man coverage with Fannin … whose action has already taken him out of the play. Unless one of the blitzers tracks down Tate from behind or Trott fails to seal the right end, the guards and Zachery will outnumber the other Hog ‘backer and the corner 3-to-2. Better and better: Trott has sealed the end like whoa* and the two blitzers are well behind the play. If Zachery–whose helmet the arrow is pointing out–can make a block on the linebacker, the Hog corner will be the only player between Tate and the end zone … and he’ll have both Auburn guards to deal with first. This play should be a touchdown. Uh-oh: Zachery has gotten himself too far upfield and let the LB slip in behind him. If Berry spots him he can still make the block and leave the corner to Isom, but there’s a lot of traffic. 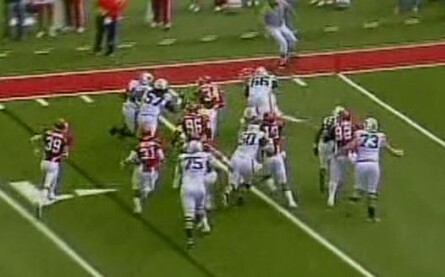 There’s another problem, too: Pugh has lost his block on the Hogs’ left DT, No. 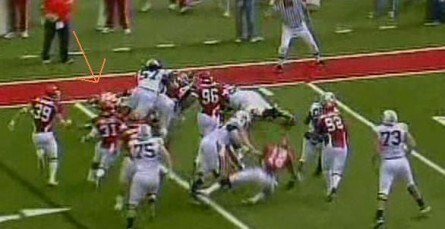 96, who’s slipped through the middle of the line and could tackle from behind if Tate has to wait for a seam. 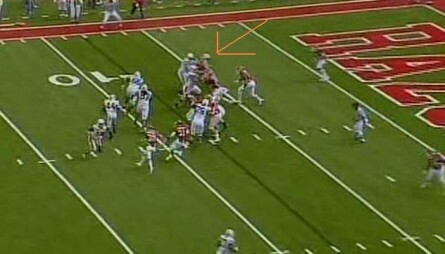 It’s hard to see, but Berry is indeed aiming for the corner and the Hog LB–getting the arrow treatment–is slicing between Trott and Berry. Making matters worse, Tate has started to accelerate (maybe sensing the pressure from inside? I dunno) and has almost pulled even with Isom. 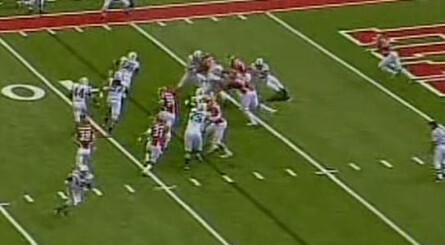 Isom may not even have the chance to make the block on the LB. It’s not happening. Whether because Tate’s been a little too quick or Isom’s been a little too slow, Tate’s now in front of his blocker and the linebacker has a clear path to tackle. For good measure, the corner has reacted quickly and already has his helmet past Berry. But the breakdown starts with Zachery: without the LB in the way, Tate could likely let Berry usher the corner out-of-bounds and cut in behind him. 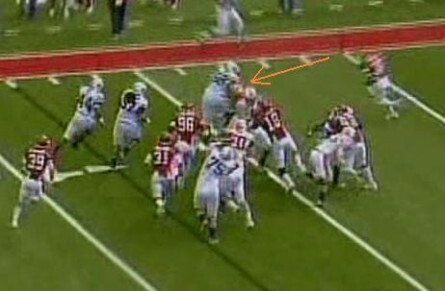 … and of course, Auburn will wind up with nothing when Tate fumbles on the very next snap. The lesson: one missed block–even one by a wide receiver, even one on a nominally “successful” play–can have some pretty far-reaching consequences. *This phrase–and, indeed, this entire post–is borrowed from MGoBlog‘s Brian Cook. Hmmm. Tell you what, I’m pretty good with Photoshop, and it wouldn’t take me more than a few minutes to make Ben score on this play. Think the NCAA would give us the win then? Excellent work. Pray continue. It’s mid-October and both our passion and hunger for football is at the absolute peak.